NEW PRESIDENT FOR GIRLGUIDING ISLE OF WIGHT. 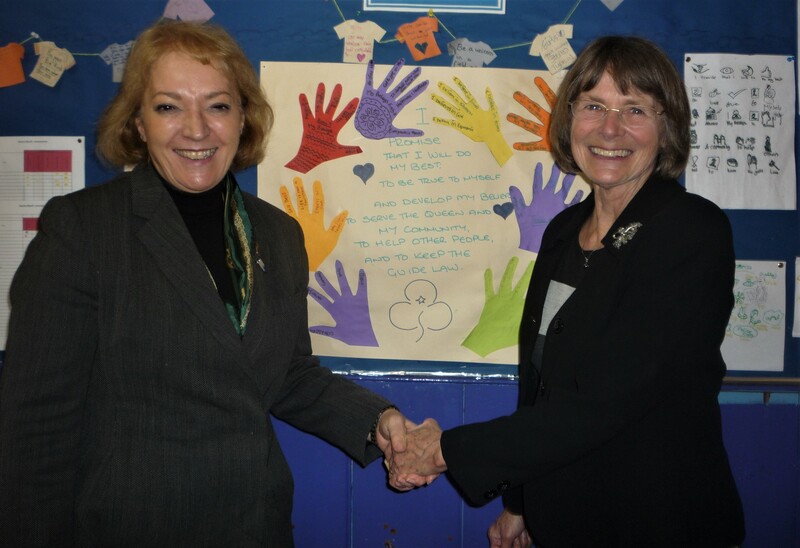 After some fifteen years Patricia Partridge has left the post as President of Girlguiding IW. Patricia has moved to the mainland and together with her husband John they will be nearer their family and be able to spend more happy moments with their grandchildren. Patricia has been the President for three terms of Island Commissioner. Agreeing to become the President when asked to do so by the then Island Commissioner Deborah Meadows Patricia continued as President when Janet Lovell became Island Commissioner, at the time when Girlguiding was celebrating 100 years. Following the joint appointment of Shirley Saunders and Lesley Clifford as Island Commissioners in 2014 Patricia continued her role as President until recently. Although Patricia had moved to her new home, she returned to the Island recently and following the most recent meeting of Girlguiding IW’s Executive Committee a presentation of a hamper containing IW produce and an IW glass piece, was made by Shirley and Lesley. Thanking everyone Patricia said that she had worked over the years with three very different styles of Island Commissioner’s leadership, but all had worked for the benefit of the girls on the Island. There had been several major changes within Girlguiding nationally, but the Island had encompassed the changes. In thanking all leaders, Executive Committee members and others associated with Girlguiding on the Island Patricia ended her short speech by saying that Girlguiding gave all its members a moral compass to follow. Welcoming Girlguiding IW’s new President Gioia Minghella-Giddens Patricia and the Island Commissioners said that they hoped Gioia would enjoy her experience within Girlguiding. Having been a Brownie in Ryde it was felt that Gioia was the ideal choice for the post and Shirley Saunders presented Gioia with her President’s Badge. As a last duty Patricia presented Lesley and Shirley with Island Awards which are presented to members who have undertaken extra service to Girlguiding on the Island.